Honolulu, Hawaii — The delivery of patient care at the State community hospitals on Oahu and the Neighbor Islands is expected to be greatly enhanced following today’s announcement that the Hawaii Health Systems Corporation (HHSC) has finalized a $28.7 million contract with Siemens Healthcare. The agreement provides the public-hospital system with a complete hospital information system including a succession of integrated electronic medical record (EMR) applications. The dynamic and seamless exchange of patient information will support enhanced care continuity and quality, and in turn assist HHSC acute care hospitals, critical access hospitals, long-term care facilities, physician clinics and their respective community physicians. An EMR system allows health care professionals to rapidly and securely consult a complete record of a patient’s health history. 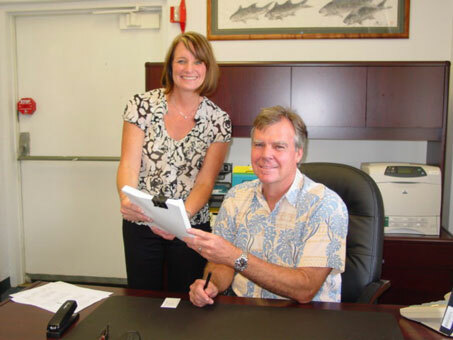 The installation of an EMR system is a key step in the creation of an integrated health network with real-time access to patient information across the system – i.e., West Hawaii region: Kona Community Hospital and Kohala Hospital; Maui region: Maui Memorial Medical Center, Kula Hospital and Lanai Community Hospital; Oahu region: Leahi Hospital, Maluhia and Kahuku Medical Center; and Kauai region: West Kauai Medical Center and Samuel Mahelona Memorial Hospital. Unleashing new efficiencies and capturing quality improvement are examples of the many opportunities that will be enabled through the utilization of contemporary information technology. Driving-out manual intervention, modernizing workflow across the HHSC continuum of care, hard-wiring change, and proactively monitoring performance through near real-time analytics are just a few of the essential elements sought by HHSC in pursuit of Meaningful Use as designated by Centers for Medicare and Medicaid Services. The HHSC East Hawaii region – Hilo Medical Center, Ka’u Hospital, and Hale Ho’ola Hamakua – started its switch to EMR in May 2010, and will join the other regions in utilizing modules of the accompanying Health Information System (HIS) function for some of its financial applications (e.g., general ledger, accounts payable, and fixed assets). The planned implementation strategy begins with Maui Memorial Medical Center (MMMC), followed by Kona Community Hospital and Leahi Hospital; West Kauai Medical Center and Kahuku Medical Center; Maluhia; Kula Hospital and Lanai Community Hospital; and then Kohala Hospital and Samuel Mahelona Memorial Hospital. Maui Memorial Medical Center’s projected “Go-Live” date is November 2012, while Kohala Hospital and Samuel Mahelona Memorial Medical Center are expected to bring their systems live in September 2013. HHSC is the fourth largest public health system in the country and the largest provider of healthcare in the Islands. HHSC is comprised of 12 public hospitals, in addition to two non-profit affiliate providers who care for all regardless of their patient’s ability to pay. HHSC provides a range of services, including emergency, specialized disease management, primary care, rural care, long-term care, home health and adult day-health – all of which improve the health of individuals and promote the economic health of our island communities throughout the state of Hawaii.